My Fav unsweetened yogurt brand. I got a lot of requests yesterday for my yogurt brand, sorry i couldn't reply, was a bit busy. You can find it in the fridge section of some select supermarkets, at least i'm sure its not in Shoprite. 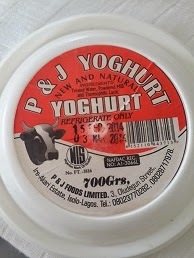 I have been taking this yogurt for a long long time and i love it! I know some people would have seen it and passed by. Lol. Please always make sure its in the fridge and don't keep for more than 2 days. If you can, call the numbers on the cover maybe they could deliver large quantities. Thanks Cheliz. I'm definitely going to try this. Very helpful. Urw Ladi. I hope u enjoy it. Will definitely try this Ebonie. Pls lets know how urs turns out. Thanks a lot hun. Keep up the good work.